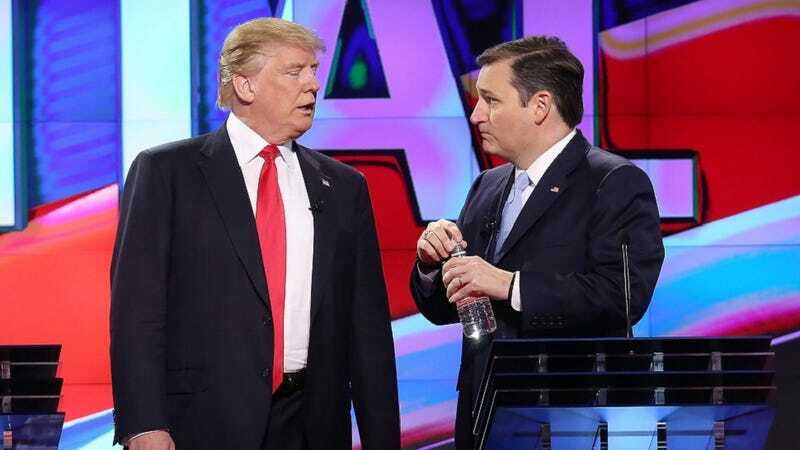 Donald Trump and Ted Cruz are here to remind you that no, you cannot defeat a fellow candidate for the presidential bid by sticking to political relevancy. These days, you win the general election by being a probable racist, probable sexist whose rhetoric I would kindly describe as “babble-vomit,” or a guy whose most recent statement makes him seem totally chill with the occasional Islamophobic police state. Apparently, the way you nab your party’s coveted nominee spot these days is lobbing insults at each others’ wives on Twitter, because if that doesn’t say “moral compass,” I don’t know what does. On Tuesday evening, Trump tweeted to Cruz in response to an ad created by an anti-Trump group based in Utah. The ad featured a photo of autonomous human Melania Trump, the GOP hopeful’s wife, taken 15 years ago at a shoot for GQ . Trump, who The Washington Post noted is known for deleting and rewriting tweets, then brandished Twitter Threat v. 2.0.